Online Donations are now available! Please consider donating today. Not only do we support local producers within 100km of Bobcaygeon, but we also provide visibility to organizations at our Community Table. In order to keep the market affordable to local vendors and continue to advertise and market to our customers, our steering committee works all year to secure product donations from local businesses and individuals (for things such as shopping bags with our logo on them and supplies for our Kids Fun Table) and grant opportunities from municipal and provincial government organizations. 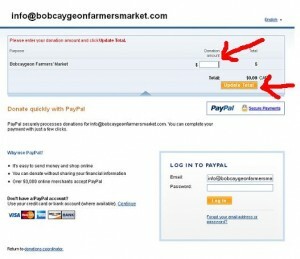 The Bobcaygeon Farmers’ Market is a non-profit organization and the steering committee is 100% volunteer. Our only paid positions are a nominal fee for our Market Manager and our student helper. 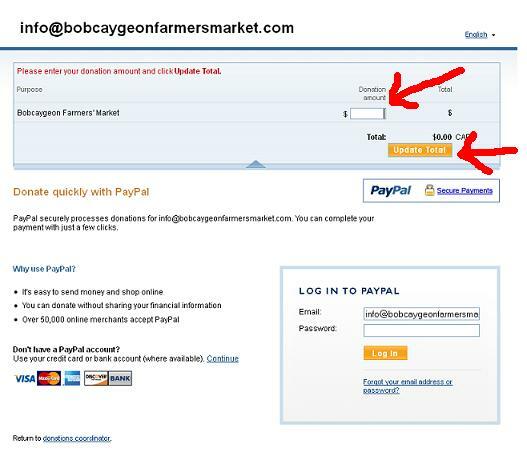 This year we are asking anyone that values what our market brings to the community to invest in the Bobcaygeon Farmers’ Market any amount that you can afford to help us operate, promote and grow the market. Your donations are greatly appreciated and the money is wisely spent to ensure locally grown food and locally produced goods are supported and made available in our community. 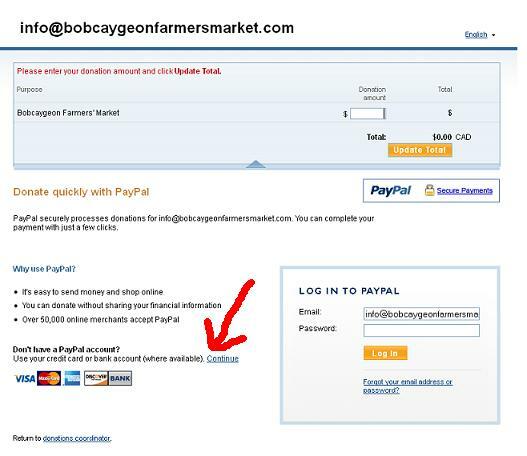 Paypal Donations (button below) are fully secure and trusted by millions of users worldwide. 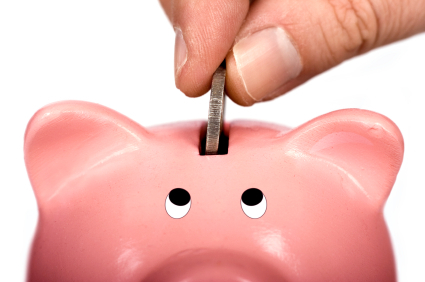 If you have a Paypal account, you can make a donation from your current balance. 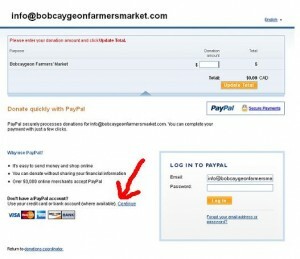 If not, Paypal also allows you to donate using your Credit Card in a totally secure environment. Click the Donate button below to get started and THANK YOU! Click on the “Update Total” button once you have entered the amount.